Since December, 33 million chickens, turkeys and ducks have been exterminated thus far with firefighting foam and carbon dioxide in Midwestern states in response to the avian influenza epidemic. The birds are ignored by the mainstream press. Instead it's all about farmers – "forced to euthanize their own live inventory" – and the price of eggs. The New York Times reports that "consumers are probably seeing some price increases, not only for cartons of eggs but also for products that contain so-called liquid eggs, which are used in everything from mayonnaise to cake mixes and are a major product of Iowa’s poultry industry. 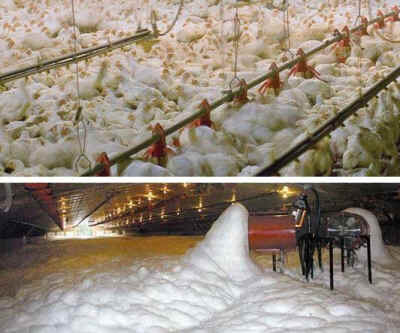 Hens being covered with foam to suffocate them. I'm thinking about the 33 million chickens, turkeys and ducks who have been exterminated thus far with firefighting foam and carbon dioxide in Midwestern states since December, in response to the avian influenza epidemic. Once more I am struck – stricken – by the stupendous brutality of the poultry and egg industries, and to cite one element of the news media coverage, I draw your attention to the industry term "euthanize" that reporters now regularly use without quotation marks (without irony), to describe – no, disguise – the killings. In a letter to The New York Times that was not published, in response to "Egg Farms Hit Hard as Bird Flu Affects Millions of Hens," May 14, 2015, I objected to the reporter’s use of the term euthanasia to describe the killing of millions of birds with carbon dioxide and firefighting foam. Euthanasia means “a good death.” It means a death that is merciful, peaceful, kind, compassionate, and humane. However, the birds are ignored by the mainstream press. Instead it’s all about farmers – "forced to euthanize their own live inventory" – and the price of eggs. The New York Times reports that "consumers are probably seeing some price increases, not only for cartons of eggs but also for products that contain so-called liquid eggs, which are used in everything from mayonnaise to cake mixes and are a major product of Iowa’s poultry industry. About 90 percent of the more than 25 million chickens that are being destroyed in Iowa produced liquid eggs." Five years ago, on July 11, 2010, a New York Times editorial, A Humane Egg, applauded the signing into law of Proposition Two in California, promoted as a ban on cages for egg-laying hens in California. This turned out not to be so; moreover, the law excludes all hens whose eggs are destined for the liquid egg trade, which is a huge part of the egg industry involving many millions of hens. Proclaiming that the new law would "at least relieve the worst of the production horrors that are common in the industry now," the editorial concluded that "Industrial confinement is cruel and senseless and will turn out to be, we hope, a relatively short-lived anomaly in modern farming." Industrial animal production is cruel, absolutely, but "senseless"? Not if the goal is to produce an unlimited supply of animal products around the clock. To hope that industrial confinement is a "relatively short-lived anomaly in modern farming" is like hoping that the Earthly Paradise is around the corner while you are in the process of blowing up a building full of people.